The #1 Best Selling Automatic Toilet Plunger. Amazing CO2 Power Clears Stubborn Clogs. Quick and Effective. Literally, Easy As 1-2-3. Fits All Toilets – Especially Newer Low-flow Toilets. Use for Annoying and Unexpected Slow Drainage. SurePlunge Forms Airtight Seal with No Splash-Back. Uses Same Harmless CO2 Gas as used in Soft Drinks. Environmentally Safe. No Harsh Chemicals. Eliminate Unnecessary or Expensive Plumber Calls. The #1 selling high-tech concept for clearing toilets at the touch of a button – in a safe, easy and cost-effective way. The SurePlunge Automatic Toilet Plunger with the Power of compressed CO2 gas. Quickly and easily unclog your toilet with the SurePlunge. Now you can easily unclog your toilet in an instant – literally, at the touch of a button – using harmless compressed CO2. 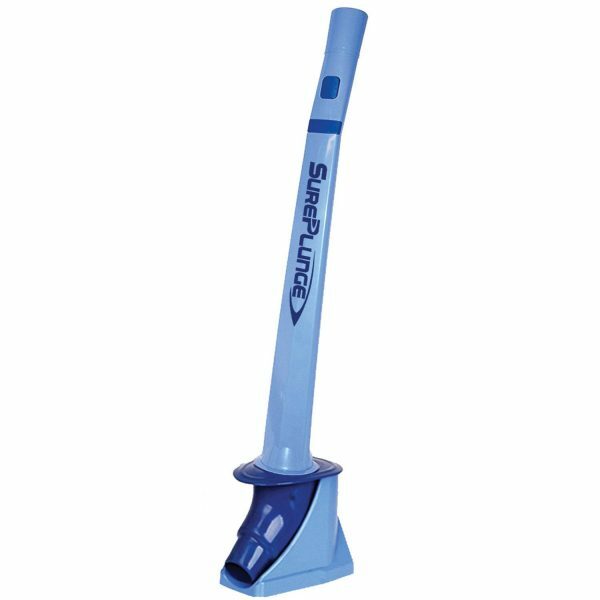 We are confident that you too will agree that the SurePlunge Automatic Toilet Plunger and the power of CO2 is the Best Toilet Plunger you have ever used. Holy Cow! This device actually works! I was very skeptical when I purchased this item. I have a toilet from hell, which is a 1.6 gal first generation water saver. It clogs if i say the word ‘clog’. It took me 2 tries to perfect the no splashback method, which I practiced on a non-clogged toilet. I could work hours with my plunger, if I wanted to, trying to push a clog through. Usually, I would end up using my 6 foot auger, and that ain’t no pretty sight to clean up, no matter how well it works. This device however, is a miracle of engineering, and in one button press, i save myself from a heart attack, trying to plunge, plunge, plunge! I usually run out of curse-words, using the traditional methods. This will run you about a dollar a ‘burst’, since that’s what the CO2 cartridges will cost. The good news for me is that I have a very easy cleanup, and I walk away with a smile on my face, knowing I just avoided another hours long event of unclogging the toilet. Bottom line…this device works! Looking at the size of the cartridge, at first I was afraid it would break my toilet. Nope, I was wrong. It worked well until I didn’t even realize the job had been done. No messy floor. If you have a toilet that continuously backs up – INVEST in this. Fortunately I have more than one toilet – and one of them just – well- is very delicate. IF you only have one toilet – ouch – BUY THIS. I am so tired of plunging, pouring in dish soap, plunging, waiting.. This is such a huge advance! Make sure you learn on a clean toilet. And order extra cartridges so that you have them on hand. Absolutely useful. Almost called a plumber, but this was delivered very quickly. Clears totally blocked drains that 3 different plungers did nothing for. My only complaint is that it only came with 3 capsules. Amazing! Never using a traditional plunger again!! A plunger is the kind of thing you don’t think about until you need one. We had a traditional one, but it really wasn’t working that well. It never seemed to create enough suction, or a good seal. I assembled this and followed the YouTube videos on using it. I hoped to try a couple of “practice runs” before actually using it “for real”, but it happened to come right when my husband informed me that the toilet was clogged (again). Instead, I placed it in the toilet and angled it back, accidentally depressed the button and blasted air into the bowl. The slight kickback of the water startled us both, and the sound scared the dog. But even deploying that burst of air accidentally was enough. The toilet drained perfectly. I threw out our old plunger and this bad boy now has pride of place right next to our toilet. If it were appropriate to give a plunger as a gift, I would- it works that well and is so ingenious. This product came with three compressed air capsules, but we bought a bulk pack of them which made the cost come to about $1.00 per use. Well worth it to never have to deal with a plunger again.